This calculator will calculate how much you would need to deposit or invest today in order for the investment to grow to a desired future amount within the desired time frame. Plus, the present value calculator will also display a printable annual growth chart so you can see how the calculated present value will grow to the desired future value on a year-by-year basis. 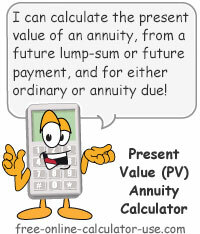 Note that if you are looking to calculate the present value of a series of future cash flows, please visit the Present Value of an Annuity Calculator. What are PV calculations useful for? Calculate the present value of a future lump sum, given the term, discount rate, and discounting interval. Enter the dollar amount of a future lump sum of money you wish to calculate present value for, without the dollar sign and commas. Select either Months or Years and enter the corresponding number of periods. Enter the discount rate to be used in the present value calculations. Please enter as a percentage but without the percent sign (for .06 or 6%, enter 6). Select the discounting frequency to use in the present value calculations. Based on your entries, this is the amount you would need to deposit/invest now in order for your investment to grow to the entered future lump sum within the specified time frame. Based on your entries, this is the total of the discounted interest earnings on the future lump sum. Or, this is how much future compound interest you will earn on the invested present value for the specified number of months or years. 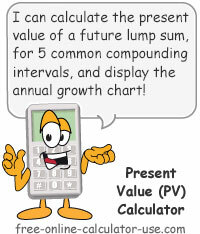 Enter the future lump sum you would like to calculate present value for. Select either "Months" or "Years" and enter the corresponding number of periods to calculate present value for. Enter the present value discount rate. Select the applicable discounting interval. 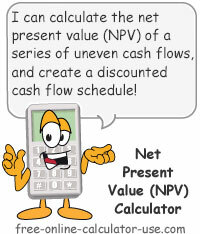 Click the "Calculate Present Value" button. This will display the calculated present value of the lump sum, the interest earnings, and a year-by-year growth chart. What "Present Value" is and what it's useful for. When I was a kid, present value could be easily determined based on whether the gift I received was a toy or an article of clothing. It wasn't until my first year of college (age 24) that I learned that present value was actually a time value of money formula used to determine how much a future sum of money is worth today. Since monies received now can immediately be deposited into an interest earning account or investment, monies received now end up being worth more in the future (the future value of a present amount). And conversely, monies to be received at some point in time in the future are worth less money now (the present value of a future amount). Furthermore, because Present Value (PV) is the result of interest being deducted or discounted from a future amount (compounding in reverse), present value is also referred to as discounting. 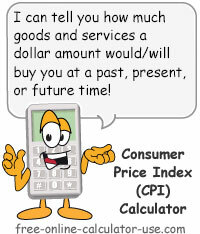 Therefore, a discounting interest calculator is virtually the same thing as a present value calculator. What are Present Value Calculations Useful For? While present value calculations are most often used in business and economics, having a keen understanding of PV, as well as having a means to calculate it, are both critical to a family being able to meet their future financial goals. For example, if you were to receive an inheritance of $50,000, and one of your goals was to save up enough money to pay for your child's college education, present value calculations will help you to estimate whether or not investing the $50,000 will be enough to cover the future cost of college. If your child is 2-years old and you estimate the future cost of college will be $120,000, and you believe you can earn 6% (compounded annually) on the $50,000 if you invest it, present value calculations will tell you that you will need to deposit $47,237.55 today in order for your investment to grow to $120,000 over the course of the next 16 years. In other words, $120,000 16-years from now has a PV of $47,237.55, which means the $50,000 should be enough to cover the future cost of your child's education. On the other hand, if your inheritance was only $25,000, you would need to plan to save enough to make up for the shortfall. If it does turn out that the lump sum is not enough to cover the future cost of college, or you don't expect to ever get a large lump sum of money handed down to you, you may want to calculate how much you would need to set aside on a periodic basis in order to have the full $120,000 16-years from now. In that case you would need to use a calculator that combines future value of lump sum calculations with a future value of an annuity factor. This type of calculator is sometimes referred to either as an annuity payment calculator, or a savings goal calculator.